Thermoplastic Elastomers (TPEs) are a class of polymers that, within their design limits, behave like thermoset rubber but that, above their melt or softening temperatures, are melt processable via thermoplastic processing methods and, unlike thermoset rubber, can be easily reprocessed and remolded. The ability to process these materials with thermoplastic methods allows for design and fabrication freedom that thermoset rubber does not offer. All TPEs are composed of crystalline and amorphous domains. Some are blends or alloys of crystalline and amorphous polymers, some are block co-polymers comprised of blocks of crystalline and amorphous domains along the same polymer chain. It is the crystalline domains that act as the “heat-fugitive cross-links” that give TPEs their thermoplastic character and the amorphous domains that give them their elastomeric character. The crystalline domains are typically referred to as the “hard” phase and the amorphous domains as the “soft” phase. While both phases contribute to the overall physical and mechanical properties of a TPE, some key properties may be associated with one phase or the other thereby guiding the selection or design of a TPE compound. 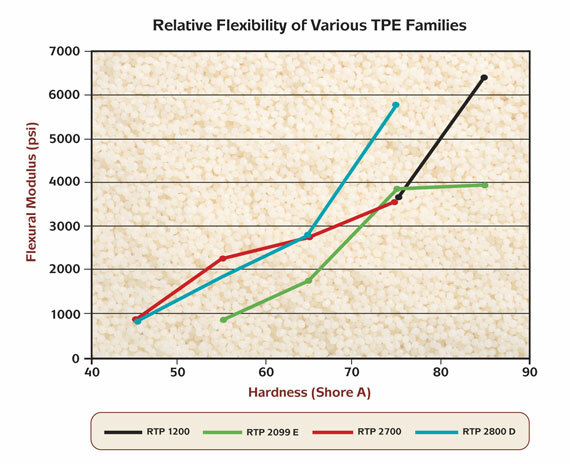 Industry has typically rated the various TPE technologies on a cost vs. performance basis. This is a convenient way of classifying materials but it can be very misleading because performance should be defined by the requirements of the application, rather than a standard property set, and the performance — price curve will vary depending upon the performance criteria of interest. In our section Choosing the Correct TPE, we list some of the criteria that RTP Company uses to narrow down and select the best TPE for an application. It is important to remember that the very thing that enables TPEs to be processed as thermoplastics also restricts their use in very high temperature applications. The continuous use temperature is the highest temperature at which a TPE will retain its elastomeric character and continue to function in an application. The various families of TPEs exhibit a wide range of continuous use temperatures and knowing the service temperature for an application is a critical first step in selecting the best TPE for that application. Continuous use temperature is reported as degrees Fahrenheit or Celsius. As was the case with continuous use temperature, the various TPE families exhibit a wide range of chemical and fluid resistance. Each has its strengths and weaknesses when exposed to organic solvents, greases, acids, bases, or any of a number of other substances. It is important to know what, if any, chemicals or fluids a TPE may be exposed to in order to make a good material selection. Chemical or fluid resistance is typically reported as weight change, volume change, or specific property change resulting from a controlled exposure to a specific substance. Hardness (typically measured on the Shore A or D scale) is probably the most common property identified with TPEs but may be the least relevant for a given application. Elongation at break, tensile strength, tensile modulus, tensile set, compression set, and flexural modulus are some of the engineering properties for which a TPE may be selected; and, while it is true that within a TPE family there is a general correlation between any of these properties and hardness, that correlation may not hold across families. For example, it is possible to have two different TPEs of the same hardness but completely different flexural modulus. Just as the name implies, this property is a measure of a material’s ability to resist tearing. It is an important consideration for any application in which a material will be subjected to the type of abuse that may result in tearing type of strain. Tear strength is measured in “pli” (pounds per linear inch) or “N/mm” (Newtons per millimeter). Compression set – the ability of a material to return to its original shape after being subjected to a pre-determined compressive strain or load. Compressive stress relaxation – the ability of a material to continue to push back against a compressive load over a period of time. Both are results of “cold flow” or plastic deformation of the solid TPE and both are affected by time, temperature, and chemical or fluid exposure. Compression set is reported as a per cent of compression that is not recovered, stress relaxation as either a per cent or absolute level of initial force that is no longer present. Peel strength is one measure of how well a TPE has bonded to a rigid substrate. While there is no agreed upon standard test for TPEs, the various methods employed by TPE suppliers are derived from accepted thermoset rubber and adhesive test methods. The RTP Company test for peel strength is RTP TP-55, which is a variation of ASTM D6892/D903. This test entails pulling apart a T-bar that was over-molded via an insert molding process. The units of measure for this test are pli; RTP Company has a minimum standard of 15 pli for its bonding grades. This failure mode indicates that either the TPE or the plastic substrate failed before the bond between the two materials did. Very often the TPE material tears. This type of failure is not always a bad property indication if the material has high tear strength. It can in fact indicate very high bond strength. This failure mode occurs at the interface of the TPE and the rigid material. Most bond failures are some combination of both adhesive and cohesive failures. 100% adhesive failure would indicate that all of the TPE pulled off the substrate. Go to Part 2: Choosing the Correct TPE.